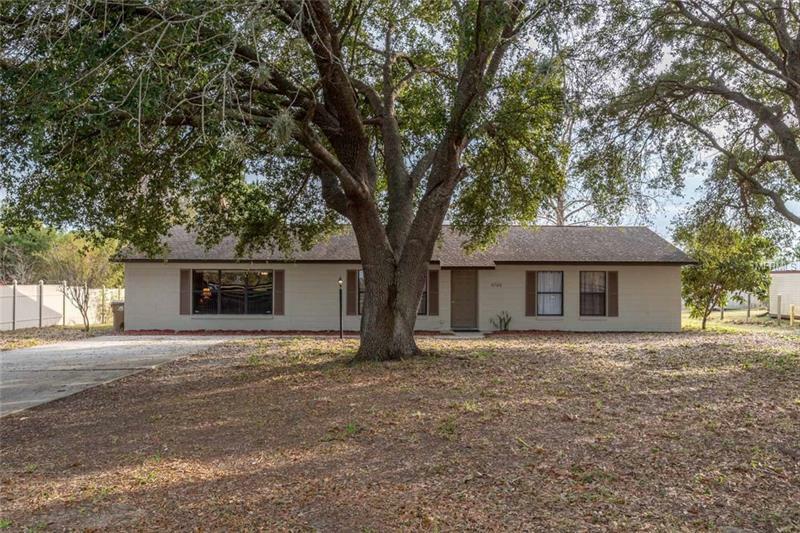 ALMOST 3/4 ACRE lot, with NO HOA fees or restrictions, plus a BLOCK home with remodeled kitchen! This is a 3 bedroom 2 bath home PLUS a den/office! The massive great room has been remodeled with an added corner, wood burning fireplace! This is a focal point of the home, has plenty of room for a large dining room, all overlooking the rear yard. The kitchen has been remodeled, has plenty of cabinets and granite counters and newer appliances! Bring your bistro table or eat-in kitchen set as there is a perfect space for this as well. Inside laundry strategically placed with some nice shelving. Off the kitchen there is an added room that can either be an enormous walk in pantry, or even a smaller office area as it has a window and a door. Outside, there is plenty of space for all your toys! There is a huge shed out back that can even be used as a garage if needed, or storage! The screened and roofed rear porch is accessible from both the great room and the den/office, perfect for relaxing with a great book, or enjoy watching family and guests in the above ground pool. Paved road and only minutes from Highways 27 and 19 plus the Turnpike, so such an easy commute.